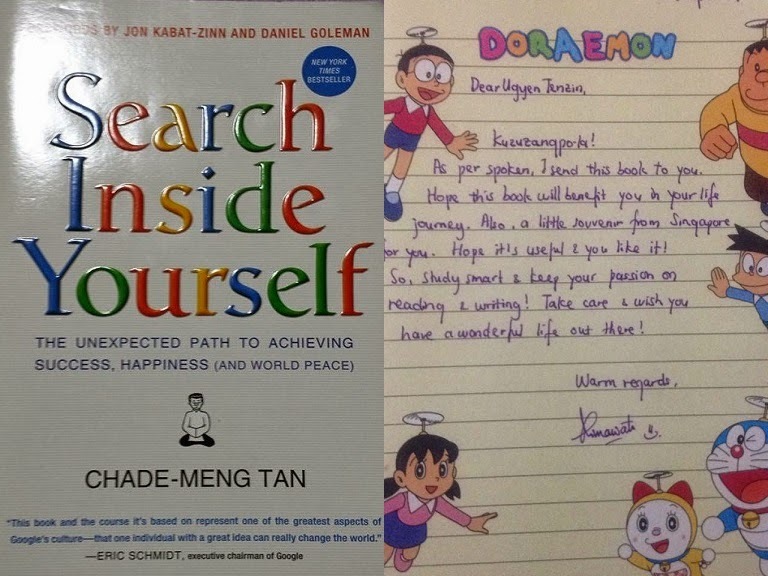 I had a thirsty curiosity for the book: "Search Inside Yourself," since a beautiful, radiant Singaporean blogger, Rima Reyka, who aesthetically blogs at her glamorous weblog Overcome Life, asked me to message my addressee for the book as my birthday gift. Who won't be me, when it comes to gifts? I went on 7th day to inquire about my package, but the watchman did not receive any. Anew, I went on 9th day, cautiously the watchman asked me to contact the staff, as ushered I contacted the staff. They apprised me to keep my contact number for the parcel, as directed I did keep. At around three pm they called me and smilingly, I got my parcel, indeed my bright birthday gift. I was breezy and cheery for the book suited me anxiously, Search Inside Yourself, was obviously a my-type of book that I would love reading and decoding. Thank you Rima ma'am for your suitable gift for me. A my-type of book is more than enough that I can expect from my friends. As written above about my newly designed motto of my life; "Search Inside Myself", on my 21st Bright Birthday, I am hoping to work determinedly with my promising commitments for its an apogee and fulfillment, for I truly believe in Aristotle's aphorism; "Knowing yourself is the beginning of all wisdom." To have achieved this, I believe that books and my own mind are the only weapons I have to start my journey, indeed I have already happily started. Once again, I on behalf of my own innate inner-self would kindly love to pay our heartfelt thankfulness and soul-felt gratefulness to Rima ma'am for your contribution in my motto and all my dear beloved friends (especially my near-dear friends who took all their precious time to stay till mid-night for your surprise wishes for cake and snacks, you have taught me the facts of friendships) for your true-blue wishes on my Bright Birthday and it means a lot to me. May you all be blessed and blissful, today and always, with all almighty God's might. I'm glad that this book could bring a motto in your life and it's such a great insight that you could think like that. How I wish my son will be as wise as you at this age! So, wish all your dream and wish come true Ugyen! All the best to your study and life! Take care!